Last week was the first meeting of the year for our Minnesota Microsoft BI User Group. The topic for the whole evening was Analysis Services including talks at getting started with SSAS (UDM) project, some tips & tricks, and then my PowerPivot presentation. We also tried using LiveMeeting for the first time with recording the presentations and hopefully in the next week or so we will be able to share that content as well. We will see because it was the first time and I haven’t had a chance to check out the recordings yet. In general I think the presentations went well and we had around 70 people all together and another dozen or so on the LiveMeeting. The one thing that didn’t go so well for me was when I had to share my desktop to do my presentation. For some reason LiveMeeting was forcing me to switch to a 800×600 resolution (haven’t ran into this before, but usually only have to switch to a 1024×768). Well needless to say when it came time to do my PowerPivot demo it pretty much tanked. Trying to work with PowerPivot with this resolution is pretty much impossible, especially went it comes time to create the PivotTables and PivotCharts along with slicers in Excel. There were quite a few spots where I couldn’t even position the dialog boxes in a position where I could even click the buttons in them, so I was just hoping that if I clicked ‘Enter’ that the dialog box would close and accept my changes I made (and they did, thankfully). It is also hard to find items in the Ribbon when it gets squished down, so you just have to be pretty much prepared for anything when it comes to doing a live demo. I tried to salvage the demo as best as I could, but eventually I had to give up and toss in the towel. I was extremely disappointed and felt awful for the attendees. I am hoping that what I was able to show along with the content that people found it useful. 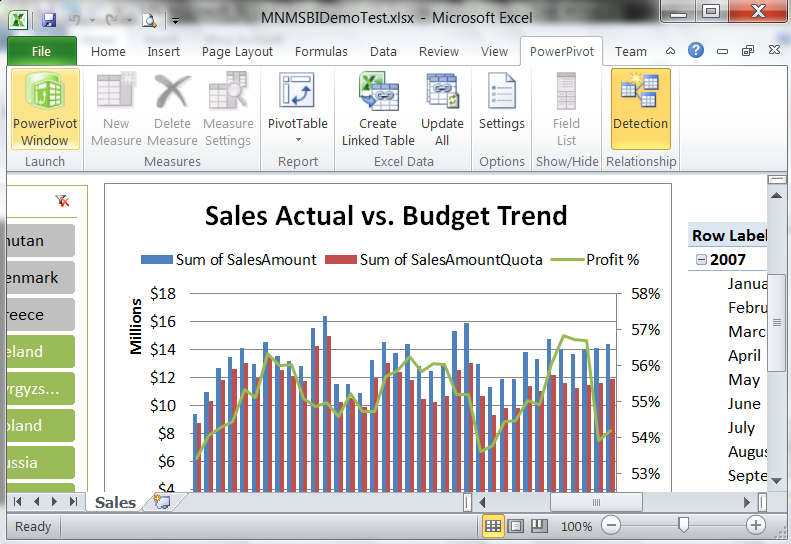 I am planning on creating a video of my PowerPivot demo to share as well. Once I have this available I will post an additional follow up posting with that as well. 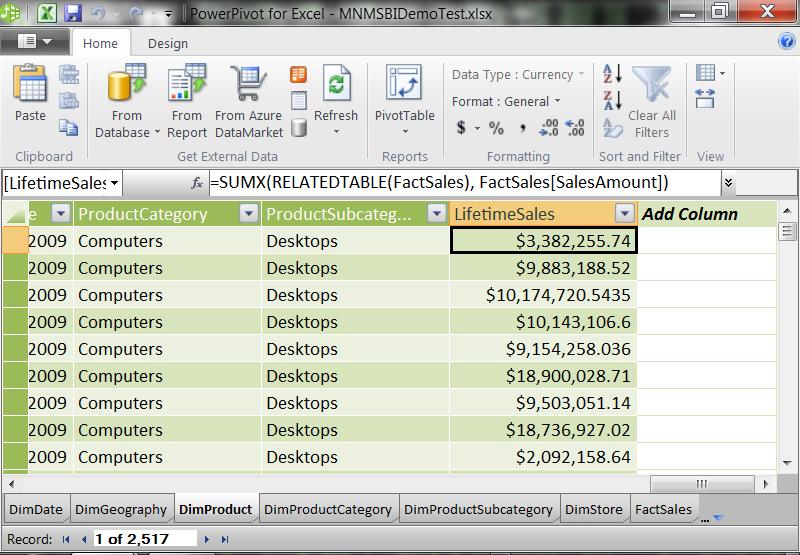 I do have more postings as well, you can simply check out the items through the PowerPivot tag. Here is my presentation deck (available from my SkyDrive account) and stay tuned for the video; I will have it available soon and post on Vimeo with my other videos and post a follow up here on my blog. Until then, enjoy the presentation content. 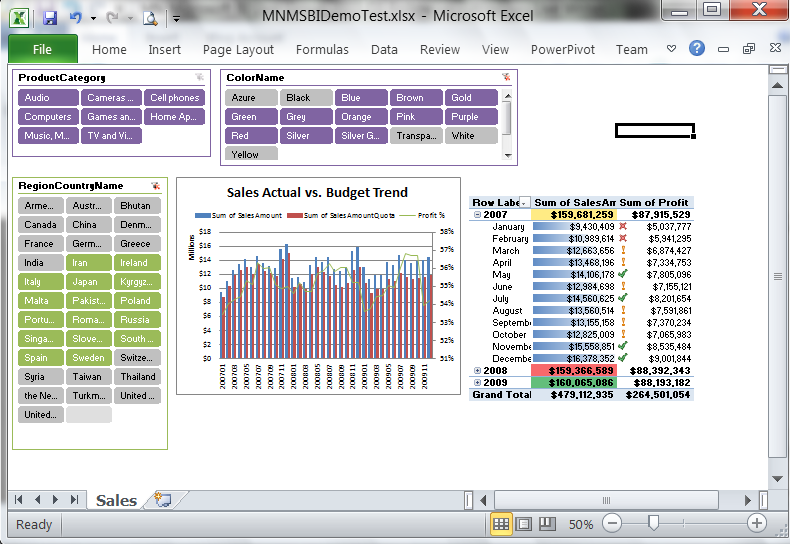 This entry was posted on March 30, 2011 at 7:03 pm	and is filed under Business Intelligence, PowerPivot, Training. Tagged: powerpivot, presentations. You can follow any responses to this entry through the RSS 2.0 feed. You can leave a response, or trackback from your own site. Great looking dashboard, I can understand your frustration at the 800×600 thing. As far as the forced resolution goes, were you also hooked up to a projector as well at the same time? I had something similar happen about 2 years ago (with another product than Live Meeting) and when we unhooked from the projector I could get resolutions for the web meeting to run just fine and then when I plugged back into the projector everything worked. Yep, hooked up to the projectors as well. So it was a combination of the two. I didn’t try to unplug, will make mental note for next time, thanks for the heads up and suggestion.